Back and neck pains may range mild discomfort to severe disabling health conditions. Such pains can adversely affect the mobility and daily activities. According to the National Institute of Neurological Disorders and Stroke (NINDS), about 80 percent of adults experience low back pain at some point in their lifetimes. All told, low back pain, the second most common neurological ailment in the United States after headache. Although back and neck disorders are responsible for significant suffering, new treatments, medications, exercise programs, and surgical advances are bringing hope to many patients with spinal concerns. 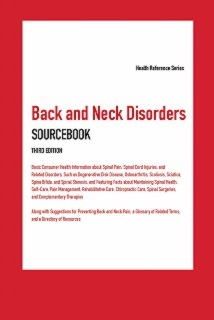 Back and Neck Disorders Sourcebook, Third Edition provides information about diseases, disorders, and injuries that affect the spinal column, including degenerative disk disease, osteoarthritis, scoliosis, sciatica, spina bifida, spinal stenosis, ankylosing spondylitis, and sprains, strains, and fractures. It also describes proper spine function and includes suggestions for maintaining spinal health. For patients with spinal problems, it offers helpful information about medications and rehabilitative and complementary therapies, along with facts about surgical techniques and the use of chiropractic care to prevent and treat spinal injuries and pain. A glossary, directory of resources for further help and information, and suggestions for additional reading are also provided. Part I: Understanding Back and Neck Problems provides information about the anatomy and function of the spine, and explains how aging affects the spine. It also talks about causes, prevalence, and symptoms of spinal disorders and describes the risk of back and neck disorders among different age groups. Tips on preparing for medical consultation with a spine specialist are also included. Part II: Maintaining Spinal Health focuses on methods of pain and disability prevention with the use of good body mechanics and proper posture. It gives an insight into the incidence and prevention of spinal pain at school, home, and work and also offers tips for easing spinal pain during pregnancy. Information about exercises including yoga and Pilates for preventing back and neck pain are also provided. Part III: Chiropractic Care provides an explanation of chiropractic adjustment and subluxation and talks about tips for choosing a chiropractor and what to expect during the first visit. It describes chiropractic care for children and adolescents and also addresses concerns and questions consumers often have when seeking chiropractic care. Part IV: Acute Injuries to the Back and Neck outlines first-aid treatment for spinal injuries. It also identifies acutely painful back and neck injuries, including stingers, whiplash, and cervical, thoracic, and lumbar spinal fractures. In addition, it offers guidance on understanding and adapting to spinal cord injuries that cause permanent disability. Part V: Chronic Disorders Associated with Back and Neck Pain includes chapters on spinal conditions such as ankylosing spondylitis, cauda equina syndrome, degenerative disk disease, scoliosis, osteoarthritis, sacroiliac joint syndrome, spina bifida, spinal stenosis, and spinal tumors and cysts. Part VI: Medications and Rehabilitative Therapies for Spinal Problems identifies common medications used to reduce the pain associated with spinal disorders such as nonsteroidal anti-inflammatory medications and spinal injections. It also deals with other nonsurgical pain relief treatments, including physical therapy, back and neck braces, ice massage, heat therapy, and hydrotherapy exercise programs. Part VII: Information about Spinal Surgeries details traditional surgical treatments for spinal disorders, including spinal fusion surgery, bone grafts, minimally invasive spinal surgery, as well as cutting-edge treatments, such as artificial disk replacement, intradiscal electrothermal annuloplasty (IDET), and percutaneous vertebral augmentation. Part VIII: Additional Help and Information offers a glossary of important terms and directory of government agencies and private organizations that provide help and information to patients with spinal disorders.